Health and Safety is the key to our business – the number one priority for employees and clients, we take pride in our work and adhere to the highest safety standards. We undertake, on average, 500 days of safety training for our own staff, operatives and our subcontractors. This includes NEBOSH, IOSH, SMSTS, CSCS, LOLER, Temporary Works etc. Regardless of the companies turnover and profitability, our annual budgets have remained identical to continually develop the knowledge and ability of our employees. Within Jennings, health and safety receives a high level of management attention. We aim to improve our health and safety record by a long-term strategy which is produced as part of the business plan each year. We are also committed to safeguarding the health and safety of the public, our clients and all others who may be affected by our activities. Health and Safety is actively managed at all levels within the company and a strong team-based approach is promoted. Managers have the support of the professional health and safety team, who are able to provide advice, assistance, training and audits with regards to all aspects of health and safety. 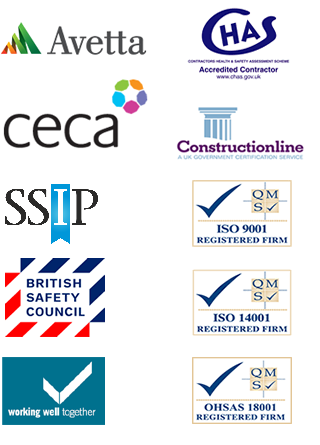 Our commitment to Health & Safety is further demonstrated by accreditation to SSiP organisations such as CHAS, and our membership of British Safety Council and our Health and Safety Management System which is certified to OHSAS 18001 standard.